Capturing couple, bridal party, and family formals portraits can be one of the most rewarding parts of a wedding day. Not only is it your time to shine as a wedding photographer, but these are the photos that you will use to showcase and market your business, as well as the ones most likely to be printed and hung on your couples’ walls. But it can also be one of the most challenging parts of the day - perhaps the schedule is running late, you’re faced with bad lighting or you’ve just run out of ideas for couple poses. Add to that people not responding to your directions and you’ve got a lot to juggle in a short space of time. 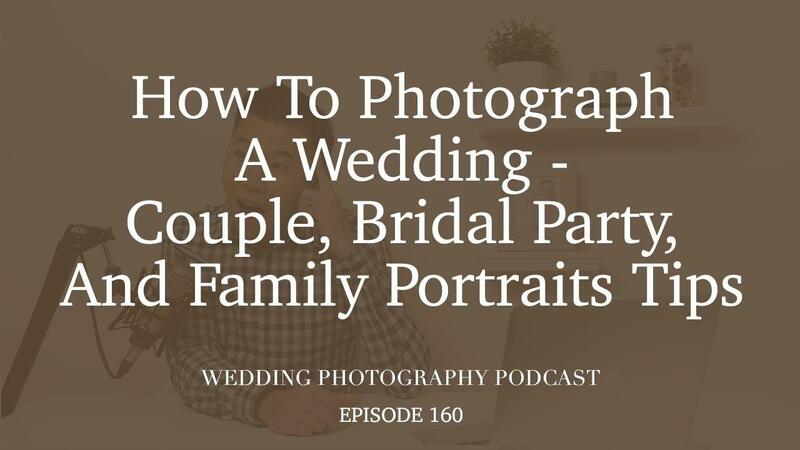 In this third episode in my five-part series “How to Photograph a Wedding”, we’ll chat about how to approach couple, bridal party, and family formals portraits. I’ll share with you some of my top tips for overcoming the challenges often faced so you come away with beautiful photos and build your reputation at the same time. From giving your couple wedding day tips and asking them to fill out questionnaires to scouting portrait locations, we’ll discuss some of the ways you can prepare ahead of time. Have a shot list so you know which combinations you need to get and take the time to get to know the bridal party and family so you can build rapport during the getting ready session.